Beads Size: 22x34mm. Length: 17". Or opening disputes. We believe in solving the issues. Main stone: Agate Quartz Moonstone GREEN AVENTURINE. Material: Silver. Item will keep and leave our storage within 72 hours. Main Stone Agate. All jewelry photos are taken by professional photographers. Jewelry Type Pendant. Save Big! 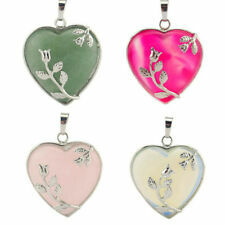 GRV JEWELRY IS WELL KNOWN FIRM FOR WHOLESALE MARKET ALL OVER THE WORLD. WE ARE DEALING IN ALL TYPE OF JEWELRY FASHION, SILVER, GOLD, DIAMOND. GRV SILVER JEWELRY 2016. We are Capturing Images in natural light or Lamp light so there may be a small deviation in color but don't worry the real item will be better than Picture. Quantity: 10 pcs. 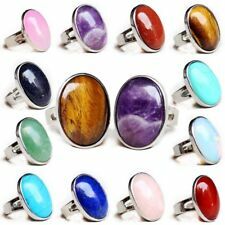 Ring size Style : Charming Jewelry Ring. Stone Style : Flower. Quantity: 1 0 pcs. (as the stone is 100% genuine From natural, so the color and size will little Different with picture ). Main Stone size: 28 28mm. DO NOT DUPLICATE OR COPY! Stone: Natural Druzy, Rainbow Moonstone. Color: Purple. Other Stone : Faceted Garnet, Rainbow Moonstone. Main Stone : Moss Agate. Base of white German silver. Top coat is silver plated and our jewellery is made with high quality silver plating procedures. Material: Natural moonstone. All our crystals & stones are natural and real. They are not lab-grown or reconstituted. For natural quartz,It is inevitable to have inclusions,veils. 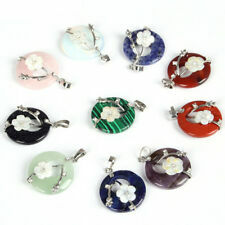 Size : approx: approx Size: 10.2mm Thread :Total:19pcs Weight : approx : 28. ~ Natural Drusy Agate & Turquoise & Blue Topaz & Druzy Drusy & Rainbow Moonstone Gemstones ~. 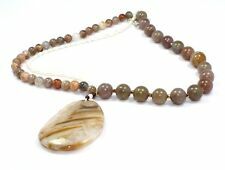 Artisan Designed Natural Multi - Gemstones 925 Silver Necklace This is a wonderful artisan designed necklace. Main Stone Dendritic Agate. 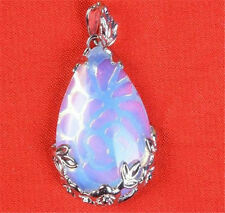 Rainbow Moonstone. Base of white German silver. Top coat is silver plated and our jewellery is made with high quality silver plating procedures. our jewellery with natural precious and semi precious gemstone. AB Tan White Botswana Agate Citrine Moonstone Silver One-Of-A-Kind Pendant 3"
Primary Gemstone: Botswana agate; cushion cabochon. Accents: Lightly antiqued, heart design setting with large Citrine oval gem and rainbow moonstone cabochon. Extra large, embossed bale. Style: Multi-stone pendant. We are very fair and easy to deal with. AB One-of-a-Kind Blue-Fire Labradorite Black Moonstone .925 Silver Earrings 2"
Primary Gemstone: Labradorite/Black moonstone, pear cabochons. Mysterious-Blue-Fire, Peacock-colors Earrings. My jewelry is genuine. 925 silver or 14 kt gold and. Colors: blue-fire, gray-green, gold, black, silver. AB One-of-a-Kind Rainbow Moonstone Blue Botswana Agate Earrings 925 Silver 2.5"
Primary Gemstone: Botswana agate; pear cabochon. Accents: Rainbow moonstone cabochons. Lightly antiqued, silver scroll & bead setting. One-of-a-Kind, Beautiful Blue-Multi Earrings. dangle earrings - hook. Stone: Natural Druzy & Rainbow. NATURAL GEMSTONES: AUTHENTIC. More will be coming in the weeks ahead. EARTH TREASURE! CONDITION: NEW WITH GIFT BOX. Connector, Agate. Connector size (With loop) : Approx-87x36mm. Gemstone Shape : Uneven. Plating : 24k Gold Plated. Connector, Agate. Connector size (With loop) : Approx-87x35mm. Gemstone Shape : Uneven.